Houston temps have been hovering in the high 90's for months, with 'feels like' temps over 100. For months! 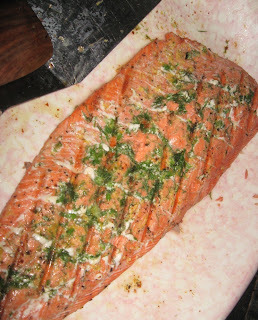 Most quick trips to the grill result in a shower and fresh shirt - even if you're cooking just one quick item, such as the huge slab of salmon stuffed with fennel we cooked last night. Indoor versions of summery foods can be accomplished under a broiler when your patio seems like a sauna. My method for roasting red, yellow or orange peppers in large strips under a broiler is easier than the time consuming process of roasting and turning a whole pepper on a burner or grill. Of course the technique works on an outdoor grill too. The indoor dishes we've enjoyed lately all rely on the chopping, carmelizing and roasting techniques that I've described over the last few weeks. Sweet and Sour Roasted Pepper Strips with Sesame Oil. 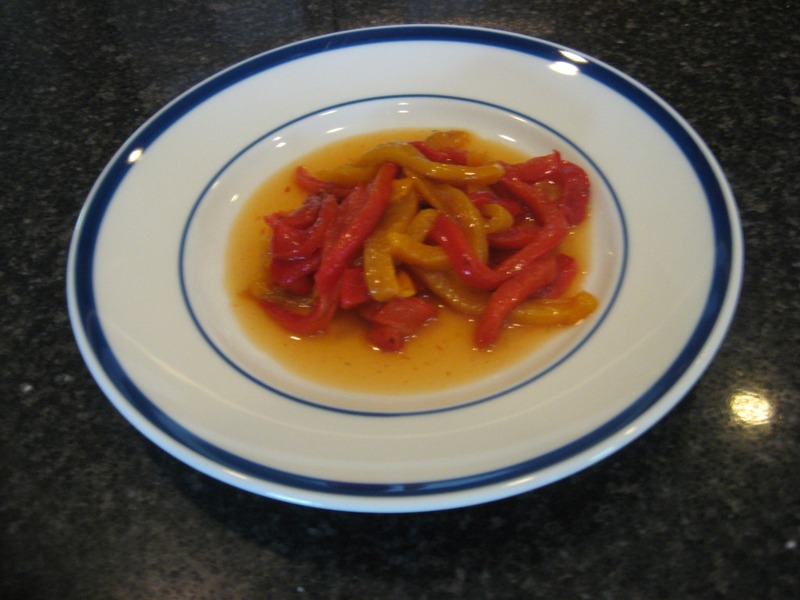 This dish is nothing more than roasted peppers with 1/2 a teaspoon each of sugar and rice wine vinegar, with a pinch of salt and a couple drops of sesame oil. Italian Sausage, Roasted Peppers and Carmelized Onions - though hearty, this dish is GREAT at room temperature. To my friends in NY, Chicago and DC who have been complaining about the heat.....In Houston our heat stays for 5 months and always has the humidity. But we do get to grill in December. And don't be makin' fun of me for staying inside sometimes. This recipe was adapted from a great recipe by the Frankies, two guys from Brooklyn named Frank, from their book The Frankies Spuntino Kitchen Companion and Cooking Manual. This cookbook is written to please any level cook. They share traditional Italian-American cooking (note: not Italy-Italian), supplemented by skills and techniques they developed as high-end chefs. They now deploy this talent at their two classy neighborhood-hangout restaurants in New York. This recipe is incredible. Yet I've modified it a little, to further make it a more efficient everyday dish for a busy cook. I believe they serve this dish with polenta (as have I, but that's a different kettle of fish). I suggest pasta and a quick par-boil of the sausage. Parboiling the sausage can can be done simultaneously with carmelizing onions and roasting peppers. Cooking pasta (or polenta if you're comfortable with that) can be done simultaneous to cooking tomatoes in the recently combined onion/pepper mixture. After a very quick soapy rinse the same pot gets used for pasta. Note: There are only 4 ingredients in this dish + pasta (and olive oil, salt and pepper, which don't count). It's about technique and ingredient quality (the sausage and tomatoes). Perform these three steps in parallel with each other to the greatest extent you can. All can be done hours in advance (put the sausage in fridge). Fill a pot big enough to cook a pound of pasta about halfway with water. Bring to a near-boil and cook 8 Italian sausage links for 10 minutes, then remove. Sausage will not be fully cooked. Preheat a broiler (or grill). Slice red and yellow peppers (and green if you want) around the core into four large segments. Place skin-side up on a foil-lined pan and broil until skins are browned. Set aside to cool. Details on this technique are here. Slice one or two large onions. 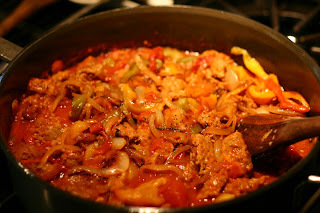 In a large skillet, heat a tablespoon or two of olive oil at medium high, add onions and cook for 10 minutes. Reduce heat to medium-low. Cook for 20 minutes more (30 minutes total). Details of this technique HERE. Remove casing from sausages and break apart. 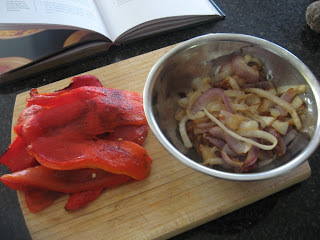 Add to carmelized onions. Cook over medium heat until sausage is slightly browned. Peel skins off peppers when cool enough to handle. Add peppers and a 28 ounce can of San Marzano tomatoes. Add salt and fresh ground pepper.Cook for a while. Five or ten minutes will do, a half hour or a little more is even better. Cook pasta per package directions and drain. Fresh pasta (yet another fish kettle) would be absolutely over the top here. 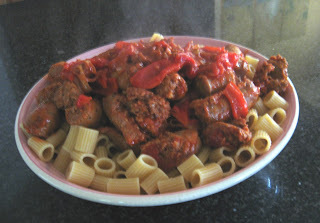 I actually have details on how to select and cook pasta....here. 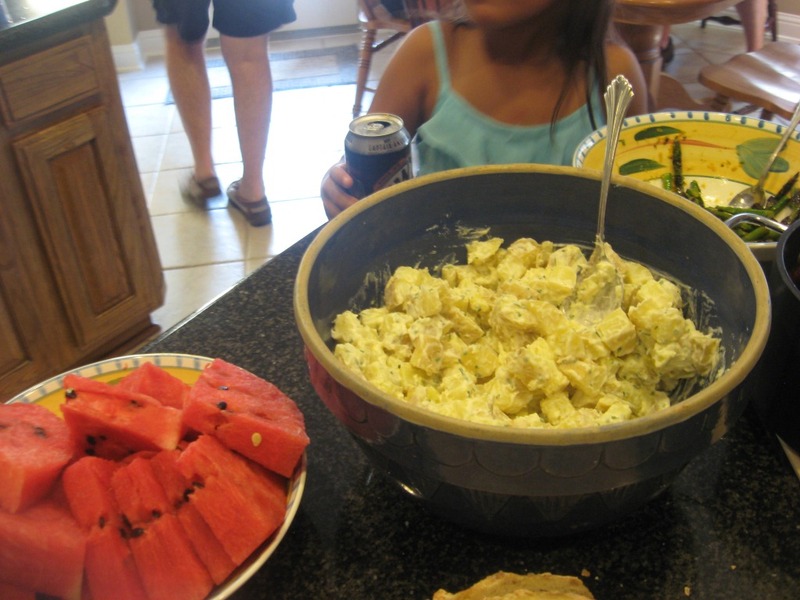 Pasta into large serving bowl. Pepper, onion, sausage over pasta. Add grated Romano or Parmesan. Basil if you've got it. The technique of cooking several ingredients separately is common in some super high end kitchens (think Thomas Keller) to allow each ingredient to be cooked to a desired done-ness and retain it's texture at a desired level. The opposite approach - creating a melthing pot of flavors, has is own distinct benefits. I like what happens in this dish - as it takes an immigrant classic and brings it up a level. Printer Friendliness for 163 Recipes and Articles on Be A Better Cook!! Apologies to my Kindle readers - this doesn't apply (yet) to Kindles. Many of you have asked for printer-friendly versions of my recipes and articles. For some recipes, but certainly not all, I've provided links to a printer friendly archive. I'm pleased to announce that ALL past and future articles on Be A Better Cook are now available in printer friendly format!! Just look for the "Print Friendly" icon at the bottom of each article and click. Not only can you print, but you can edit out any section you don't want, email the article / recipe or even create a PDF. Way cool. 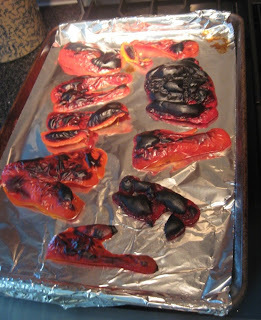 This method for charring the skin and roasting red, yellow or orange bell peppers has become my favorite technique for indoor broiling or outdoor grilling. This approach is easier than roasting a whole pepper which requires turning it occasionally to char each side. Cut the peppers into four panels and lay them skin side up on a foil-lined pan. Broil the peppers for around 5 minutes, until they are mostly charred all over. Time depends on heat of broiler and how close/far pan is to the heating element. Remove from the oven and let them just sit on the pan until cool. For some reason, they don't need to be covered and the skins will still peel off nicely. No step needed to "place peppers in a bowl and cover", "put in a paper bag and shake",or "peel skins holding peppers under a cool stream of water if still very hot". Definitely no steaming hot cores that can singe your fingertips. Bring a large pot of water to a boil, add at least one tablespoon of Kosher salt. Add potatoes and cook approximately 7 minutes. Test a piece at 5 minutes, then every minute thereafter to get perfect doneness. Immediately plunge into an ice bath. Drain when cool. Combine rest of ingredients then gently stir into the drained potatoes. Doesn't that phrase sound fancy and complicated? Ice bath. It's nothing more than a bowl of water with ice cubes. It's also a technique that can take your vegetable cooking skill from novice or capable all the way to expert in no time. Here's why. One of the hardest things to do is to get a food, especially a vegetable, cooked to the right temperature. Especially if you're cooking in boiling water. Even if you do get it near-perfect, the residual heat in the vegetable allows it to keep cooking. The solution? Ice bath. Especially if a vegetable can be served cold or room temperature. As soon a veg in boiling, salted water gets to perfect doneness, use a mesh strainer, a perforated / slotted spoon or any utensil to dump the vegetables into a bowl of icy water. In a matter of minutes the heat will dissipate and you have perfectly cooked vegetables. Use a really big bowl of ice water. Who cares, it's just water. And ice. When testing a single piece, skewer it on a fork and dip it into the cold ice water for a few seconds, then taste to see if it's done. This technique is particularly well suited to cooking green beans (especially thin French haricot verts) and potatoes - as each hold heat easily. 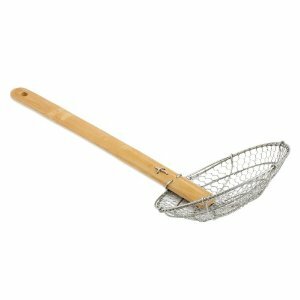 When I mentioned a mesh strainer, I was picturing (and suggesting) the contraption in the picture above. It's often called a spider strainer, because it looks like a spider web. You can buy one at amazon by clicking here . But the shipping will probably cost more than the strainer. The best place to get them is at Asian markets. If the vegetables you're cooking are not going to be served room temp, you can use the same technique but just stop the cooking a little earlier than totally done. One of the testaments to the importance of this technique is how heavily Thomas Keller relies on it. He's been considered the best chef in the country for quite a few years now. 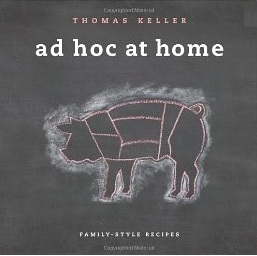 His book Ad Hoc At Home is supposed to be geared to home cooking. But like him, it's actually quite, well, particular. Just like him. Though I did meet him at a book signing once and he was quite nice, even though it was the end of the evening. If your household is like ours summer lunches are pretty easy. Kids often make their own simple sandwiches, fruit is out in bowls all day (really), the kids grabs some crackers, cheese, a yogurt or something reasonable as a snack. Even if there are a few batches of mac and cheese, or a couple hot dogs warmed in a microwave, its a far cry from school lunches. Especially with summer camps, vacations and the myriad of special programs almost every kid does. For most of the year we perform a juggling act to get a decent lunch out to our kids on school days - balanced by the dreaded phrase (to us) - "Yes, you can buy today". Watch any episode of Jamie Oliver's Food Revolution and you might not say that again. The apparent duplication of the last 10 or so items on the list is not a typo. 270 calories, 90 calories from fat. But the cardboard tab that had the nutrition information is 100% recyclable. The container, of course, is not. It's easy to mock such a product, so here are some more useful and thoughtful articles about home cooking you might enjoy. They might even provide some inspiration now for the school lunch season coming up in August/September. 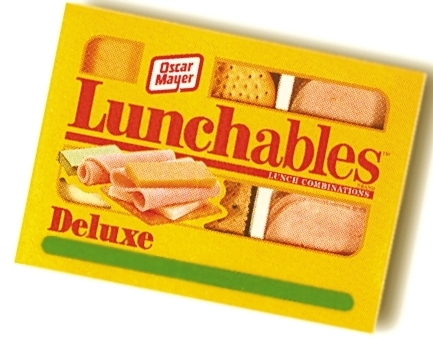 David Guas, a chef from Virginia packs healthy lunches for his kids, as described in his article Last Days For Lunchables. By 'Last Days' he isn't referring to the end of school - rather the end of Lunchables. Nutritionist Kirsten Kirpatrick breaks down food labeling in Do You Know What's in Your Food?